LiquidTitan operates a state-of-the-art petroleum/chemical processing and transloading terminal. Located in Parker, Arizona the facility is only a five hour drive from Los Angeles, a few hours from Phoenix, Las Vegas, and the Mexico Port of Entry. La Paz County landfill is less than five miles away for industrial waste needs. Heated and metered rail-to-truck transloading through our fully automated loading rack. Real-time web based reporting is available to customers on demand. The gated facility with twenty four hour access is operated by experienced rail/haz-mat certified personnel. 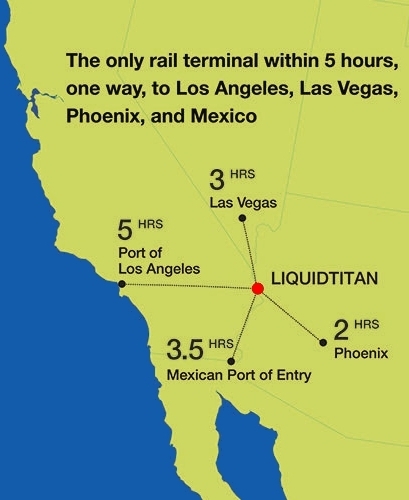 By truck or rail, LiquidTitan is THE best industrial access to Southern California.